When we set goals or start new things they can often seem insurmountable. Perhaps you have started learning a new movement with your horse and you can’t even do it at all at first and you just think you are never going to get it. I have this a lot in my classes and with my one to one clients. Using the gym ball as an example, I have had loads of people who couldn’t even sit on the gym ball with their feet on the floor without wobbling never mind lifting their feet or kneeling on it. However each time I saw them we would repeat the exercise. Just sitting on the ball trying to sit in balance, we might focus on what their hips were doing or perhaps their shoulders and eventually they would be able to sit balanced with their feet on the floor. Then we would start to lift the feet just one at a time and begin the process again. Before they know it they are sat on the ball feet lifted, talking, using bands etc. These improvements didn’t happen overnight but each time they practiced they would make tiny 1% improvements that week by week added up to achieve their overall goal. So if you are struggling with something don’t think you will never get there, just focus on achieving one small aspect of it at a time. Just aim to improve 1% each time you do it. If it’s something with your riding you are struggling with ask yourself one day. How could my hands be better at this? Then you just focus on improving your hands until they are more correct. Then you move onto how could my legs be better at this? And so on until bit by bit you start to ride a little bit more like someone who can do that movement. Just aim to improve 1% at a time and those 1%’s will soon add up to make 100%. 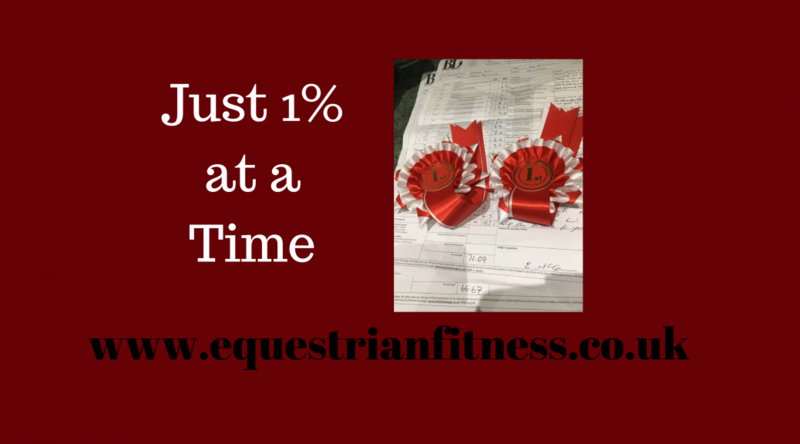 And hey I’m pretty sure 1% better has made some huge impacts on dressage competitions! I read an article this week that said research had shown that on their own as much as 98% of Adult horses will not fall in or out on turns and circles, this only happens with a rider on board. This of course leads us to believe that the cause of falling in or out is in fact the rider. I for one am definitely inclined to agree. So often riders have told me that their horse falls in on one rein or out on another and no matter what they do they can’t fix it. However when we then assess the riders position even on a straight line we almost always find some sort of asymmetry and uneven weight distribution. This of course then transfers to the horse and then exacerbate further on a turn or circle, so whilst that rider thinks they are asking for a perfect right circle what they are actually asking for is too much in with the rein and then sending back out with the seat and many variables of this cause falling in or out with the shoulder, neck and haunches. So if this is you it’s time to stop blaming your horse and have a really in depth look at Exactly what You do on turns and circles on both reins. Starting straight on and from neutral-first we must establish neutral. Can you feel both your seat bones equally? Are your feet equal weight in your stirrups? Is your rib cage directly over your pelvis –or try sternum in line with pubic bone. That is front to back and left to right? Do you arch, hollow or tip to one side? Is your head floating on top of your neck, central and looking ahead? Are your hands equal weight, height and length on the reins? It is really useful to have someone on the ground to help you with this as often what we think is happening is not necessarily the case. We wouldn’t be fluffing our circles if it was would we! Now in a walk start a 20m circle and run through the check list again. You see the idea is not to lean to the inside and motor bike around the corners. It is perhaps useful to imagine you are on train tracks and as they run around a circle they still stay equal distance apart and you remain equally attached to them. 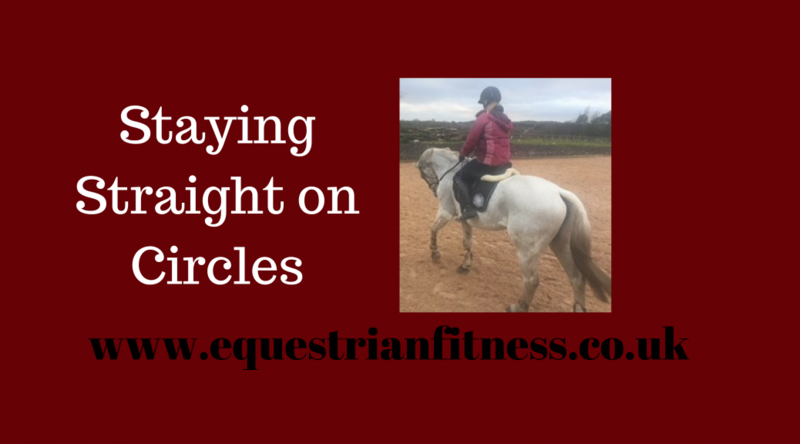 As you turn; your body will turn with your horse so in fact you stay in neutral together around the circle. Are your seat bones still equally weighted? Are your feet equal weights in the stirrups? Is your rib cage directly over your pelvis? Are you still looking straight ahead? Again it is really useful to get someone to watch this. If that’s not possible I often set my phone up in the corner of the arena and video myself to watch back afterwards-it’s brutally useful! If you can keep everything in balance throughout the circle on both reins I guarantee there will be an improvement in how your horse performs them. As riders our aim is to be equal balance and strength front to back and side to side. This gives us the best foundation for absorbing and working with the force of the horse underneath us. We also want an equal connection and reaction time from the top to the bottom of our body. You see if we give aids we want them to be instant, clear and concise and of course to get the desired reaction. If you need to give an aid for say Shoulder in. 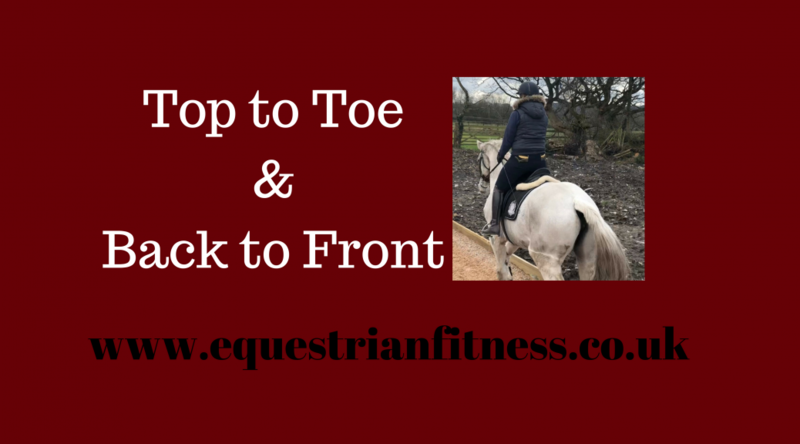 You put your inside rein on and your inside leg on to create the bend at the shoulders and then the outside rein and outside leg then also act at the same time to support the movement and stop the horse falling in at the shoulder or turning and the hind from swinging out. Now when done well this all happens simultaneously, but if we do not have equal strength and reaction time what may actually happen is this: Inside rein comes on and creates bend at neck, inside leg kicks in and has to try and create bend from the rest of the horse. The horse starts to turn before the outside rein kicks in so in fact it has to now try to turn the horse back whilst the outside leg is basically a lost cause! You see what happened here was not one aid of bend at the shoulder, stay on the track moving forward but in fact a series of smaller aids one after the other-I know the scenario will sound familiar to many of you! This is why equality and harmony from top to toe and side to side is vital! We very rarely give an aid with just one part of our body, with a right hand aid the right leg, left hand and leg support and vice versa etc. If the support act doesn’t kick in at the same time as the aid your horse will do exactly what that aid asked him to do-in the above example turn his neck………as your leg didn’t support and tell him shoulder. This of course doesn’t just apply to shoulder in, it applies to any aid in fact. It applies to your ability to ride straight lines – what if the left side asked for forward first before the right side came too? Then of course circles, lateral work and so on. Then back to front and back equality. This is a big area in the ways it presents and causes problems so I may write about it in more detail another time as it is commonly misunderstood, however the basic premise is that your should be equally working the front and back of your body the entire time you are riding. This not only creates a good neutral alignment but it also enables you to absorb the movement of your horse more effectively and therefore give better aids and in many cases prevent the many cases of back pain, shoulder pain, hip pain etc. Let’s try this really simple exercise to see whether your top and bottom, front and back, left and right can fire at the same time. Starting on your back. Try lifting your left arm and leg up at the same time-does one lift quicker than the other? Now try the right side? Now try opposite sides so left arm right leg. Notice if it is consistently say your arms that lift first, can you make arms and legs lift at the same time? Now try the same exercise on your front. Notice if this feels easier or harder than on your back. If it feels harder you perhaps favour your muscles on the front of your body and of course vice versa if it was easier on your front you favour your back muscles. Again can you lift top and bottom and left and right at the same time or does one always fire first? This will give you an idea as to how you give aids on your horse. I always lift a leg first, my left side was much easier and more equal and I favour my front muscles. How about you? Ok, here goes the last of this run of nutrition blogs. 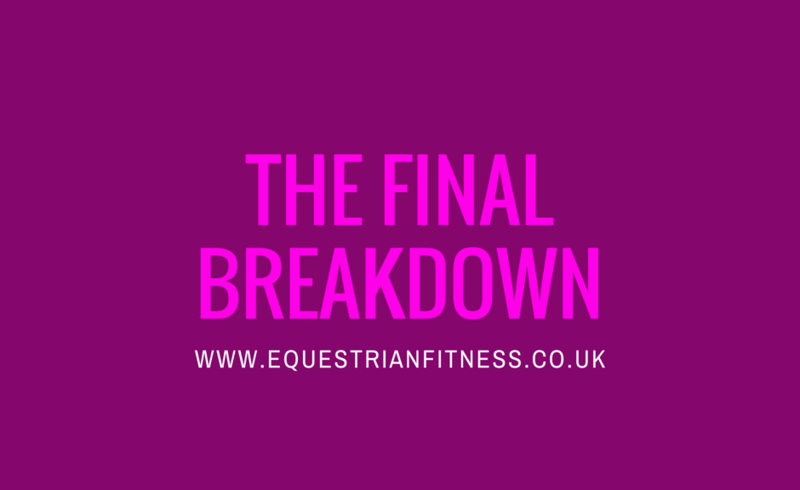 After taking a look at the different macro nutrients, then how many calories we should be eating over all, we will now look at how much of each macro nutrient that should break down to. Now I’m going to put a bit of a plot spoiler in right now-there is no magic number break down that suits everyone. There are however a couple of things to focus on and then the rest can be adapted to suit your preferences, lifestyle etc. Firstly Protein and Carbohydrates have 4 calories per gram and Fat has 9 calories per gram. As busy people who tend to take a few bumps and tumbles, Protein should be high on our priority list to repair muscles and keep us strong. It is also very satiating (keeps you full) so a great choice is you do not eat regularly or are trying to lose weight. A rough guide to protein consumption should be around 1.5g-2g per kg of bodyweight. I weigh around 64kg so at 2g that would be 128g of Protein per day. This works out in calories as 128g x 4 calories per gram = 512 calories of Protein. If I were eating 1800 calories per day this leaves 1288 calories. For Fat a good starting point is 1g per kg of body weight so for me 64g x 9 calories per gram = 576 calories of Fat. This then leaves 712 calories for carbohydrates which at 4 calories per gram = 178g. This works fairly well for me, although I do find I would naturally favour carbohydrate foods over Protein and I therefore have to be more careful in ensuring I hit that Protein number. Otherwise I suffer with energy highs and crashes quite dramatically through the day if I exist on a high carb diet. Equestrian cannot survive on pizza and dougnuts alone! Now for you this may not be the case. You may find you do better with slightly less Fat and more Carbs. Or perhaps you prefer a much higher Fat and Protein intake and lower carbs. If you want to really nail your weight, energy and health goals I suggest first monitoring your current intake just eating as you currently do. Then log alongside it your energy levels, mood etc. along with any weight implications of necessary. Then use the above guidelines as just that-a guide. If you are finding your current eating habits are leaving you over weight, underweight or tired and sluggish try working towards the above guidelines and then monitor how your weight and energy changes. Once you start to see some improvement you can use that information to tweak according to your own needs. 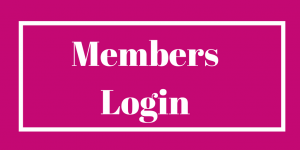 As always I love to hear your feedback and comments-and your recipes of new things you have tried as a result of reading this blog! If you need help with your nutrition my regular Personal Training (muggles) Business offers Online/Remote Nutrition Personal Nutrition Coaching at £50 per month so hit reply if you want to sign up.